Seven species of Eimeria (E. acervulina, E. brunetti, E. maxima, E. mitis, E. necatrix, E. praecox and E. tenella) are recognized to be causative agents of coccidiosis in chickens of the genus Gallus gallus. Until recently, Eimeria praecox was considered to be a non-pathogenic species unable to cause adverse effects in the host. In fact, in 1970, when Johnson & Reid wrote the milestone article that for the first time standardized and described the scoring scale for lesions caused by all Eimeria spp., Eimeria praecox was not included. It was, and still is, well know that E. praecox is not able to provoke pathognomonic lesions like E. acervulina, E. brunetti, E. maxima, E. necatrix and E. tenella, however even then some researchers were investigating whether this species of Eimeria was truly non-pathogenic. Peter L. Long in 1968, attempted to demonstrate the adverse effects of Eimeria praecox on the host and for this purpose he compared its effects with those of Eimeria acervulina. His conclusions were that even if E. praecox was less pathogenic than E. acervulina, high doses of oocysts of E. praecox depressed the rate of weight gain and food and water consumption. Some years later, in 1982, Gore and Long reported that mortality and morbidity are not characteristics associated with Eimeria praecox, however in their studies it was shown to interfere with digestion and consequently cause significantly retarded weight gain. It was the first time that E. praecox was recognized to be economically significant and thus could no longer be considered non-pathogenic. At the same time, the first prevalence studies were performed and the general outcomes for Eimeria praecox prevalence were quite surprising: this species was shown to be present in many countries all over the globe and with percentages that were far from what was considered to be negligible. From 2003 to 2008 HIPRA also performed several prevalence studies in Europe -namely in Spain, Belgium, Italy and France- and the widespread presence of Eimeria praecox was also confirmed by these (Pagès et al. 2015). 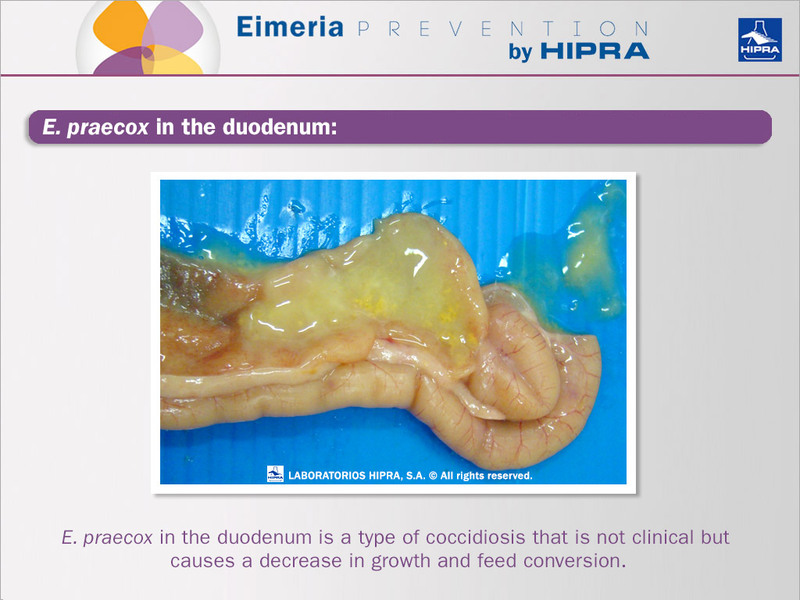 In 2012 HIPRA performed the first study of Eimeria spp. prevalence in South Africa (Pagès et al. 2015) and there, too, E. praecox was found to be present on 9.5% of farms. Further confirmation that Eimeria praecox can exhibit a wider range of virulence than previously thought, came in 2009 from a study conducted by Willians et al. 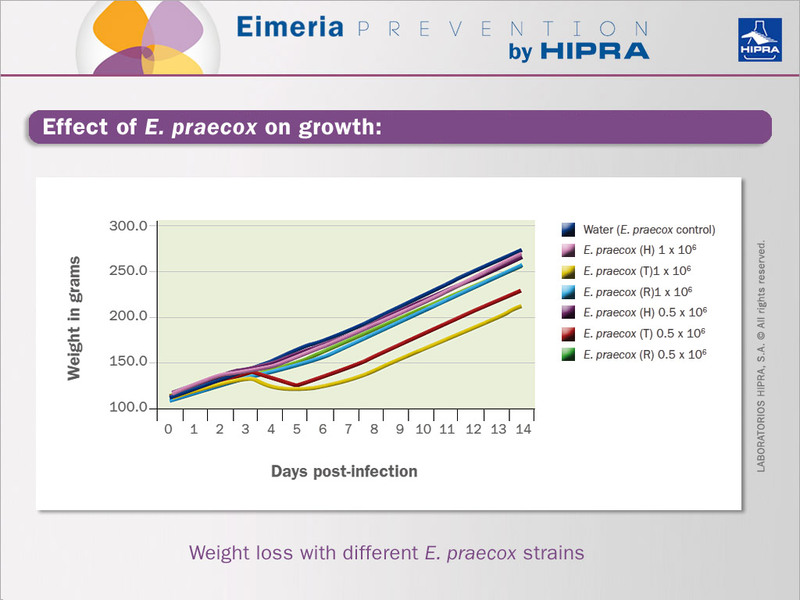 where it was observed for the first time that E. praecox was able to cause actual body weight loss and market increases in FCR, as did E. acervulina. Also for the first time, it was observed that the virulence of E. praecox may not only be equal to but may exceed that of E. acervulina. In the field, single Eimeria species infections are quite rare and most of the time infections involve multiple species. Since Eimeria praecox replicates in the same tract of the gut as E. acervulina -the duodenum- and both impact early in the production cycle, one of the aspects to be investigated was whether during a co-infection with these two species either a competitive exclusion or a synergic effect took place. In 2012, Répérant et al. found that when E. praecox -even with a low infective dose- is inoculated together with E. acervulina, its negative effect on growth was added to the latter and significantly increased compared to a single E. acervulina infection. Nowadays it is quite clear that Eimeria praecox constitutes one of the major causes of subclinical coccidiosis with repercussions on the productive performances and due to its early impact in the cycle, it is especially important in broiler meat productions where the first weeks are crucial for the overall performance of the birds. It is therefore worth taking into account this species of Eimeria in prophylactic approach to fully protect poultry. HIPRACOX® was the first attenuated vaccine for coccidiosis in broilers that took this aspect into consideration by also including E. praecox in its composition. Aarthi S., Dhinakar Raj G., Raman M., Gomathinayagam S., Kumanan K., 2010. Molecular prevalence and preponderance of Eimeria spp. among chickens in Tamil Nadu, India. Parasitology Research 107(4), 1013-1017. Chapman H.P., 1982. The use of enzyme electrophoresis for the identification of the species of Eimeria present in field isolates of coccidia. Parasitology 85, 437-442. Gore T.C., Long P.L., 1982. The biology and pathogenicity of a recent field isolate of Eimeria praecox Johnson, 1930. J. Protozool. 29, 82-85. Györke A., Pop L., Cozma V., 2013. Prevalence and distribution of Eimeria species in broiler chicken farms of different capacities. Parasite 20, 50. Haug A., Gjevre A.G., Thebo P., Mattsson J.G., Kaldhusdal M., 2008. Coccidial infections in commercial broilers: epidemiological aspects and comparison of Eimeria species identification by Morphometric and polymerase chain reaction techniques. Avian Pathol. 37, 161-170. Johnson J, Reid WM. 1970. Anticoccidial drugs: lesion scoring techniques in battery and floor-pen experiments with chickens. Exp Parasitol 28(1): 30-6. Kučera J., 1990. Identification of Eimeria species in Czechoslovakia. Avian Pathol. 19, 59-66. Lee B.H., Kim W. H., Jeong J., Yoo J., Kwon Y.-K., Jung B.Y., Kwon J. H., Lillehoj H. S., Min W., 2010. Prevalence and Cross-Immunity of Eimeria Species on Korean Chicken Farms. Journal of Veterinary Medical Science 72 (8), 985-989. Long P.L., 1968. The pathogenic effects of Eimeria praecox and E. acervulina in the chicken. Parasitology 58, 691-700. Mattiello R., Boviez J.D., McDougald L.R., 2000. Eimeria brunetti and Eimeria necatrix in chickens of Argentina and confirmation of seven species of Eimeria. Avian Dis. 44, 711-714. McDougald L.R., Fuller L., Mattiello R., 1997. A survey of coccidia on 43 poultry farms in Argentina. Avian Dis. 41, 923-929. Moraes J.C., França M., Sartor A.A., Bellato V., Barbosa de Moura A., Borba Magalhães M.L., Pereira de Souza A., Miletti L.C., 2015. Prevalence of Eimeria spp. in Broilers by Multiplex PCR in the Southern Region of Brazil on Two Hundred and Fifty Farms. Avian Diseases 59(2), 277-281. Morris M.G., Woods W.G., Richards D.G., Gasser R.B., 2007. The application of polymerase chain reaction (PCR)-based capillary electrophoretic techniques provides detailed insights into Eimeria populations in intensive poultry establishments. Mol. Cell. Probes 21, 288-294. Pagès M., Dardi M., Rubio J., 2015. Prevalence of Eimeria spp. on European broiler farms. Proceedings of the XIXth World Veterinary Poultry Association Congress. Cape Town, South Africa, 158. Pagès M., Dardi M., Rubio J., 2015. Prevalence of Eimeria spp. on South African broiler farms. Proceedings of the XIXth World Veterinary Poultry Association Congress. Cape Town, South Africa, 158. Répérant J.M., Dardi M., Pagès M., Thomas-Hénaff M., 2012. Pathogenicity of Eimeria praecox alone or associated with Eimeria acervulina in experimentally infected broiler chickens. Veterinary Parasitology 187, 333-336. Sun X.M., Pang W., Jia T., Yan W.C., He G., Hao L.L., Bentué M. and Suo X., 2009. Prevalence of Eimeria Species in Broilers with Subclinical Signs from Fifty Farms. Avian Diseases 53(2):301-305. Williams R.B., Marshall R.N., Pagès M., Dardi M., Del Cacho E., 2009. Pathogenesis of Eimeria praecox in chickens: virulence of field strains compared with laboratory strains of E. praecox and Eimeria acervulina. Avian Pathology 38(5), 359-366. Next Next post: Eimeria tenella is probably the most diagnosed Eimeria on the planet, but what is the prevalence of the other Eimeria species that cause coccidiosis in poultry?